A Christmas Story Oh Fudge. Creamy chocolate fudge in a 8 oz box. This fudge is made from scratch in copper kettles which gives it a homemade taste. 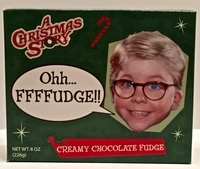 Everyone loves the movie A Christmas Story and it's known for the saying "OH Fudge " now you can enjoy some delicious milk chocolate fudge as you watch the movie. This fudge is manufactured in Ohio not far from where the movie was made. We triple dog dare you to try some today.